All right, so opening a checking account might not exactly be something you get excited about, but it may be high time to give this workhorse of your financial life some deeper thought. Your checking account is the central hub of your day-to-day money matters, with payments coming in (yay ) and expenses going out (boo ). So don’t just choose any old checking account. Here are five things to look for first. No maintenance fees or minimum balance. Many financial institutions are more than happy to charge you a monthly maintenance fee for the privilege of keeping your checking account with them. Or, to let you jump through hoops in order to avoid paying that fee—like maintaining a daily minimum balance, making a minimum direct deposit, or using your attached debit card a certain number of times each month. But there’s no need to settle for this. According to a 2018 Bankrate.com survey, 41 percent of non-interest bearing checking accounts are free of monthly maintenance fees. Credit unions and community banks are especially likely to offer fee-free checking. Obviously it would be ideal to avoid overdrawing your checking account. But, life happens. And when it does, there’s no reason to have insult added to injury in the form of hefty and/or multiple overdraft fees. Look for a checking account with a more forgiving overdraft policy. You may also want to consider overdraft protection. When you opt for this feature, your financial institution will temporarily cover charges (up to a certain amount) instead of allowing the payment to “bounce.” Some credit unions and banks will also allow you to link your checking account to your savings account in order to automatically move funds out of the savings and into the checking account if you’re about to overdraw. Who hasn’t been there before: off your usual beaten path, in need of some cold hard cash, with no familiar ATM in sight. So you withdraw the necessary funds from some other bank’s ATM, resigning yourself to pay the price. And you don’t just get hit with a “surcharge fee” of an average $3 from the operating bank. Because the ones closest to us can hurt us the most, you’ll likely also face an average “out-of-network” fee of over $4 from your own bank! Don’t let this happen to you again. 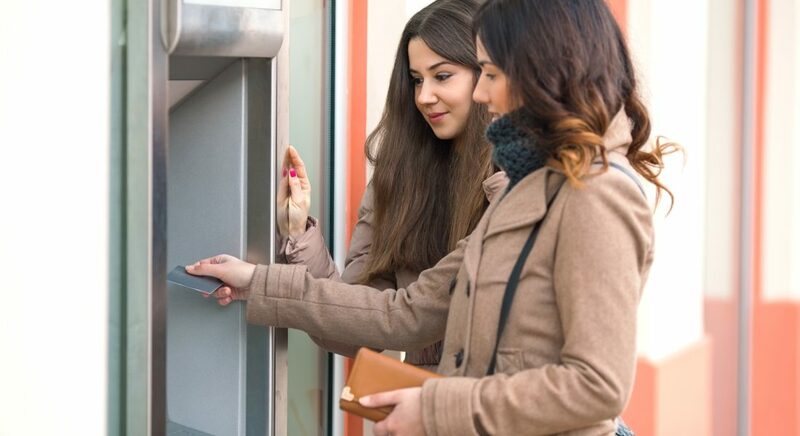 Open a checking account with a financial institution that offers a large, nationwide network of ATMs. Or, if that’s not possible, one with a policy of reimbursing out-of-network fees. As nice as it is to get friendly, face-to-face help from your local tellers, you’re on the move a lot and a mobile banking option could definitely make life a little easier sometimes. Look for a checking account that offers a free, secure mobile app. Great features to have include mobile deposit (saves you time and gas money), online bill pay, and the ability to transfer funds between linked accounts. Most checking accounts don’t pay out a whole lot of interest, if any. Yes, there are high-interest checking accounts out there. But do you have enough cash sitting in your checking account, over a long enough period of time, for that interest rate to really matter? Well then you may be better off moving more of your money into a high-yield savings or money market account. These accounts are usually even more profitable. It’s also safer not to keep very large sums of money in your checking account, in case a criminal somehow gets a hold of your debit card information. That said, it is wise to keep a safety cushion of extra funds in your checking account if you can. However, most experts recommend no more than one to two months’ worth of expenses plus an additional 30 percent. Ready to choose the checking account that’s right for you? Member One’s One Choice Checking Account offers mobile banking, overdraft protection, a nationwide ATM network and Purchase Rewards … plus, friendly local service! Learn more about Member One's checking accounts.